Fruit-bearing plants are the glory of the garden. Not only do they add beauty to the landscape, but they also produce edible fruits. Fruits, by definition, are edible crops containing seeds, and they include berries, grapes, tree fruits, melons and even some crops usually thought of as vegetables. Strawberries, grapes and berries come back year after year, while warm-season crops, such as tomatoes, melons and peppers grow for one season and die. Blackberries, like many fruits, are highly perishable and expensive to buy. Tomatoes are one of the most popular crops in home gardens, probably because a homegrown tomato tastes so much better than those purchased in the produce aisle of the grocery store. Hundreds of varieties of tomatoes are available, from small grape and cherry tomatoes for salads, to Roma tomatoes for sauces or beefsteak tomatoes for slicing. Tomatoes are warm-season plants, thriving in warm, moist conditions. Plant them after all chance of frost has passed, and keep the soil evenly moist. Many gardeners prefer to stake and prune tomatoes to control their gangly growth, although they can be left to sprawl on the ground. Select disease-resistant varieties, or consider heirloom tomatoes. Peppers belong to the same family as tomatoes and have many of the same growing needs. They are a bit finicky about temperatures and drop their blossoms when temperatures fall below or above the ideal temperatures of 70 to 85 degrees Fahrenheit. Peppers also come in hundreds of varieties and hues. Bell peppers are thick-walled and juicy. Find red, yellow, green, orange or even chocolate-colored peppers. Chili peppers can take drier conditions and are a good choice for gardeners living in western or southwestern states. These peppers are often roasted, peeled and used to flavor Mexican dishes. Many gardeners have a love-hate relationship with zucchini, which are easy to grow and produce prolifically from midsummer to fall. In fact, they keep on producing long after everyone is tired of zucchini. One plant is usually sufficient for most families. Use zucchini in stir-fries, stews and sauces; grill it; freeze it; or make it into bread, muffins and cake. Replace cucumbers with zucchini in pickle and relish recipes. Cantaloupe and watermelon produce juicy, flavorful fruits, but they require a long, warm growing season. Watermelons grow best in mild, warm regions. Northern gardeners will have more success with cantaloupe. Plant them in rich, fertile soil on a slope so that cold air pockets drain away. Plant them only after air temperatures have warmed above 70 degrees, and apply black plastic mulch to the soil to keep them warm. Although the flesh may be eaten, many gardeners grow pumpkins solely for fall decorating purposes. Pumpkins, like melons and cucumbers, grow on sprawling vines and take up considerable space in the garden. One or two pumpkin plants need at least 6 to 8 feet to grow. 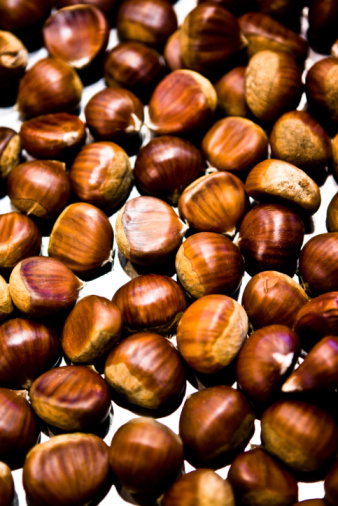 Plant them from seed in late spring, when soils are warm and all chance of frost is passed. Try the flat, deep orange Cinderella pumpkins or white pumpkins. Sugar pie pumpkins produce small, round pumpkins that small children can carry. Pumpkins are prone to powdery mildew, but the disease doesn't generally cause damage to the fruits. Raspberries grow throughout much of the United States, thriving in northern climates where other fruits perish. Raspberries come in red, yellow, purple or black and grow on canes that are somewhat thorny. Raspberries require full sun and evenly moist conditions to produce a good crop. They may be everbearing, producing fruit several times during the summer, or fall bearing, producing fruit in the fall only. Some produce fruit only on 2-year-old canes, while others produce fruit on new wood, as well. Blackberries are related to raspberries and have similar growing conditions, although they are less cold-hardy. The fruits are larger, seedier and slightly more astringent than raspberries and have a filled center, whereas raspberries are hollow. Blackberries may grow on erect canes or have a trailing form. 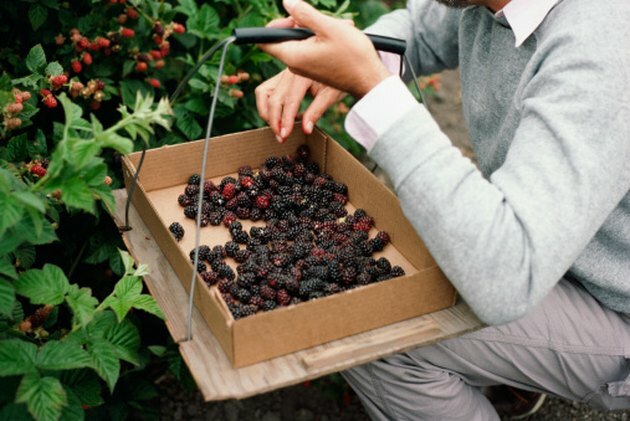 Trailing blackberries require trellises to support their sprawling growth. Strawberries are among the easiest fruits to grow. They grow in containers, hills and rows and spread through trailing vines. Strawberries are either June-bearing or everbearing. Older plants, known as the mother plants, eventually become unproductive and are removed, usually after two years. The fruits are highly perishable. Protect them from birds with netting and pick them as soon as they are ripe. Eat them fresh, or make them into jams and pies. Gooseberries are not widely grown but are a good choice for northern gardeners. Gooseberries thrive in moist, cool areas and can even tolerate partial shade. They grow on thorny canes and produce round, translucent fruit in late summer. The fruit may be green to red and is very tart. Gooseberries are seldom eaten fresh but are used in pies and jellies. Currants are related to gooseberries and have similar growing requirements. They, too, grow best in cool areas in the northern United States. Currants are sweeter than gooseberries and are used dried in baked goods, or in wines and preserves. Currants and gooseberries are prone to several diseases and require annual pruning. Few nurseries carry plants in stock; consider online nurseries for a better variety.